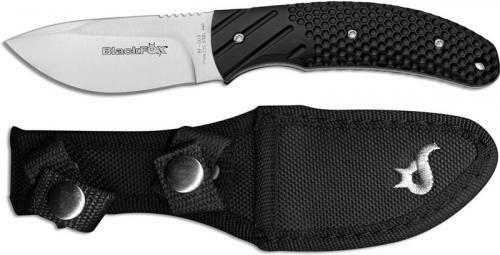 The BlackFox BF-009 Outdoor Knife features a 3 1/8 inch drop point fixed blade made of 440A stainless steel, 3mm thick, with a Rockwell hardness of 55-57, a top swedge and a notched thumb rest for secure grip. The BF-009 has full tang construction for strength, black FRN (fiberglass reinforced nylon) scales with grooved and dimpled texture for secure purchase, and a lanyard hole. A nylon belt sheath is included. This BlackFox Outdoor Knife has an overall length of 7 3/4 inches, and it weighs 4.8 ounces. Made in Italy. I have no problems with the BlackFox knife. The problem I have is with the sheath. It came with two straps that are supposed to snap together. After trying several times I got one of the straps to snap together. There is no way that the other snap will close.